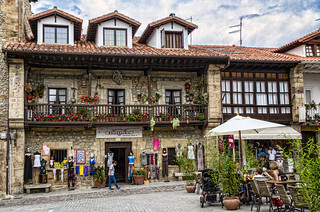 Comillas is a charming town located in the autonomous community of Cantabria, northern Spain. Famous for his university and his modernist buildings. Among them was, "EL CAPRICHO" of architect Gaudi. This is one of the beautiful streets with stone houses, shops, bars, flowers and people walking or drinking something. Comillas es una encantadora ciudad situada en la comunidad autónoma de Cantabria, al Norte de España. Famosa por su universidad y por sus edificios modernistas. Destaca entre ellos, "EL CAPRICHO" del arquitecto Gaudi. Esta es una de sus preciosas calles con casas de piedra, tiendas, bares, flores y gente paseando o bebiendo algo.